Manchester United won comfortably against a poor, limp Arsenal side devoid of ideas, inspiration and pretty much everything you need to win a football match. For the neutrals, this might have been the dullest United-Arsenal game in ages. Gone are the days of Wenger vs Ferguson, Keane vs Viera, Keown vs Nistelrooy, a United-Arsenal game is not a ‘big’ game any more. And yesterday’s game showed the vast gulf between both the teams. United could easily have had 4-5 goals and except for Cazorla’s golazo at the end, Arsenal didn’t create a single good opportunity. Defensively Arsenal’s weakest side is their left and offensively United’s strongest is their right. Although Valencia didn’t particularly have a good game, the majority of United’s successful attacks were on that side. Andre Santos, like against Schalke in midweek, didnt have a very good game and wasn’t helped by Podolski at all. The first goal arrived when Rafael made a trademark overlapping run and put in a cross. Podolski had a very strange game neither going forward enough nor doing enough to check Rafael’s overlapping runs. He should not play for Arsenal. Period. Although injuries to key players like Gibbs and Diaby didn’t help the Frenchman in his team selection, leaving out Theo Walcott (although he didn’t do much after he came on in the second half) after his midweek goal scoring exploits was a strange decision. But a bigger error was made in not removing Wilshere after he was warned for a tackle just before his second yellow. His counterpart Sir Alex removed Tom Cleverley for Anderson after the Englishman was warned. Although he didn’t have much choice but to play Andre Santos, Wenger could have possibly gone with Coquelin instead of Wilshere so that he could have offered much needed support to the Brazilian. Robin van Persie’s arrival this summer meant that Rooney for the first time in years isn’t the spearhead of United’s attack. He didn’t have a very productive afternoon in front of goal, missed a penalty and rarely got in dangerous positions. But the one quality which separates the scouser from other world class players around the world is his unselfishness and his willingness to work for the team. His marking of Mikel Arteta was so impressive that Arsenal in the first half couldn’t bring any of their offensive players into play. Which meant Cazorla had to drop deeper and deeper leaving Giroud isolated up front. And this also meant Michael Carrick had the time and space to pick out passes at ease, although his long range balls were off radar, he initiated many attacks especially towards his right. Only in the latter stages when Rooney was tiring, Arsenal could build play from the back. This performance actually is uncharacteristic of Rooney, who even though works hard for the team, isn’t very disciplined when asked to mark opposing players. In both the 2009 and 2011 Champions League finals, his job was to stop Busquets from spraying the ball to Barca’s midfield which he failed to do. Him being Arsenal’s captain puts Wenger in a very difficult position. The Belgian has been making mistakes regularly this season and in my opinion should be dropped. And Vermaelen doesn”t look like captaincy material, last year this time also Arsenal were struggling, but they had a inspirational captain in Van Persie who single handedly dragged the team to third position. In Vermaelen they have someone who is struggling to justify his own selection and so there is not point in expecting him to inspire and lead his teammates. Wenger has a big decision on his hands with regards to captaincy. 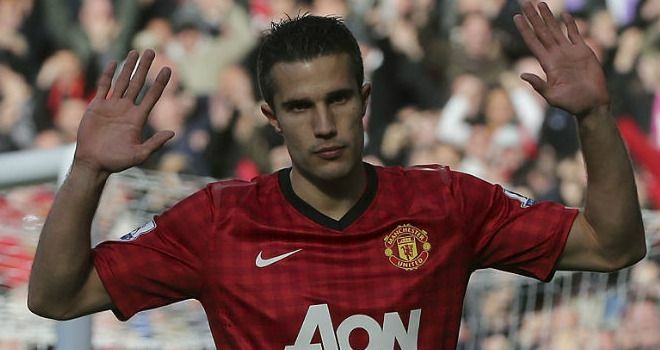 No article reviewing Manchester United vs Arsenal is complete without mentioning the 29-year-old Dutch striker. He did miss couple of gilt-edged chances yesterday, but what a signing he has proved to be. People were questioning Ferguson’s decision to spend so much on a striker when United’s midfield desperately needed reinforcements, but RVP’s arrival has managed to paper over the cracks in United’s midfield. When asked about his and Rooney’s role in the team, he joked that both of them played as 9 and a halfs. Which is true, both of them are involved in creating and scoring goals, although Rooney is more involved in the former and RVP the latter. Manchester United’s season is going from strength to strength especially as they finally have gotten over their dependence on Scholes and Giggs. With key players still to return from injury, they are strong favorites to win back the Premier League title. Arsenal on the other hand are in a similar situation they were in last year, but the big difference is they don’t have anyone to pull them through this year. They need Wilshere back to his best and also Diaby back from injury. When all are fit, Arsenal’s midfield is certainly among the best in the league but without a quality striker at top, what’s the use of creating numerous chances? Olivier Giroud is certainly not Robin Van Persie, they need to get someone like Huntelaar in the January window to have any hope of making it to the top 4.